The past few evenings have seen me taking quiet walks along the beaches of Cape May and, when you do this, it's not long before you realize two things: 1. there's a lot of great beach bird breeding habitat here and 2. there's not a lot of it protected. Of course we Humans want our places to hang out, but we have to remember the smaller guys around us too, who might not be too keen on sharing too close a space with something big enough to eat them! Though very little of Cape May's total beach area is actually protected, it pains me to see that some folks can't even cope with that and, on most walks, it really isn't long before you see someone 'exercising their rights' as I am sure they would like to call it. This can often be a relatively innocuous 'I'll walk where ever I please' mind set, right up to 'I'm going to ride my motorcycle where ever I like'. It's a shame that some people want the full nine yards all the time and really don't want to compromise. Even so, our beach birds do have their fans and I am sure they are grateful for it. The work of a multitude of conservation organizations comes together during the summer months and staff do what they can to protect the birds and educate us all on what is going on and how best we can learn to live along side our fellow sentient beings. 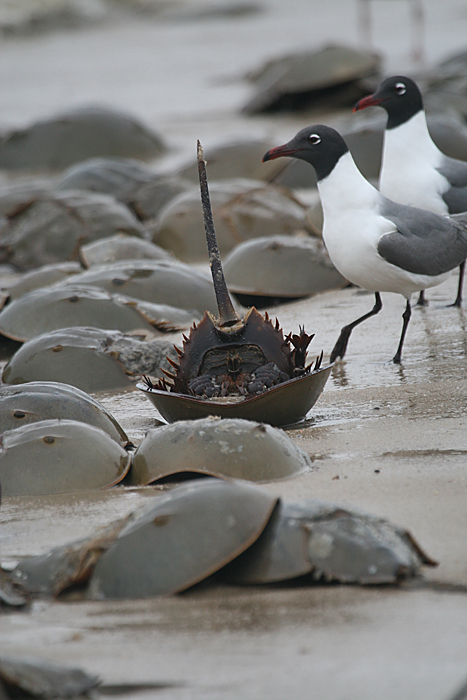 Most beach nesting birds have evolved eggs that blend so well with their sandy surroundings. Look carefully and you might spot a single egg, just showing from within the nest depression beneath this bird. Beach nesters use little or no nest material as it would simply help to give away the location of the egg [photo by Mike Crewe]. 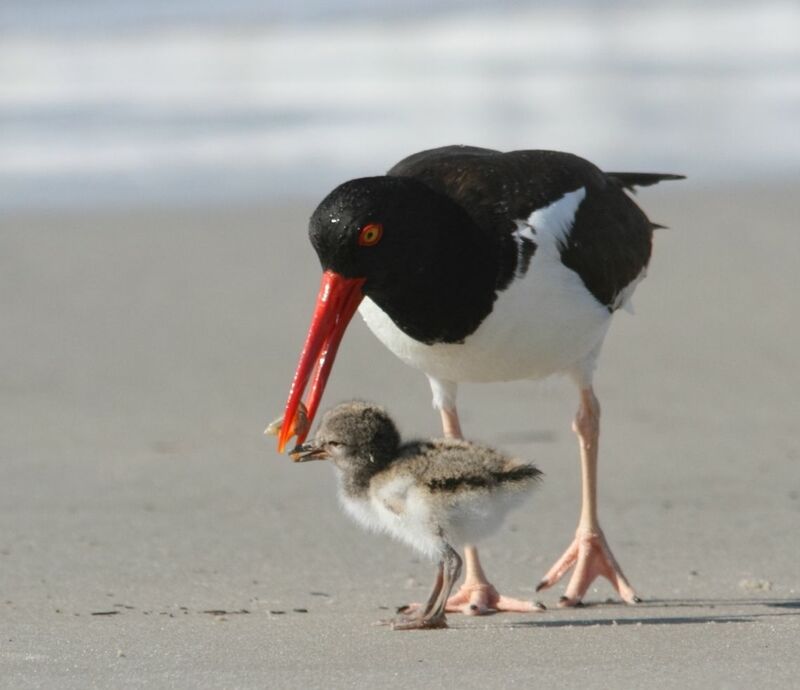 American Oystercatchers are widespread breeders but nevertheless can suffer locally from disturbance. Unlike most shorebird chicks, young oystercatchers receive a lot of close care and attention from their parents when they are small [photo by Beth Polvino]. Black Skimmers usually seem rather oddball, ungainly birds, but they can look much more graceful when performing their protracted courtship rituals [photo by Mike Crewe]. Black Skimmers rarely nest south of the Cape May Canal but, with much nest-scraping and bowing going on, maybe we'll get a few pairs breeding with us this year [photo by Mike Crewe]. Go enjoy the beach, but please remember that it's just a place for us to play - but a life or death place for wildlife. Be a good egg and share the beach (have you done that pledge yet?!). Well, we told you they were coming and now they are here - tens of thousands of Periodical Cicadas are creating one heck of a din in Belleplain State Forest! This is an event that only takes place once every 17 years so I recommend making the best of it while you can. These really are fascinating creatures and so different to the regular, annual cicada species that we get here. Periodical Cicadas are much slower in flight and in there actions than other cicadas. You can pick them up quite easily (they won't harm you at all, they prefer plant sap!) and study them at close quarters. Look around on the ground and low vegetation and you will find the old skin cases that they have emerged from after spending 17 years below ground, sucking sap from tree roots. 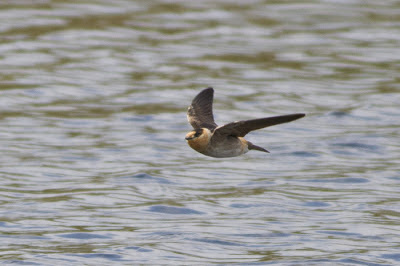 Already the birds are having a great time, feeding on any that they can catch. The empty shell of a Periodical Cicada (technically called an exuvia) remains where it was abandoned, on a low bush or in the leaf litter on the forest floor [photo by Mike Crewe]. Another cicada stretches its wings and gets ready to head for the treetops [photo by Mike Crewe]. There's some great dragonflies on the wing around Cape May right now, with migrants arriving from the south at the Point, and local breeders appearing all over Belleplain. This tandem pair of Lancet Clubtails was at Weatherby Road last weekend [photo by Mike Crewe]. Here's an insect you all will know, even if you don't know that you know it! This is Polistes annularis, one of those paper wasps that make those little dangly nests that you see hanging inside roof spaces and under eaves. I post this so that you can compare it with the next picture, since all is not what it might at first seem in the insect world [photo by Mike Crewe]. And while we are on insects - here's one you really don't want to see. This is the larva of the Gypsy Moth, a European species that is now at large in North America and capable of causing great devastation to oak trees, This little guy came crawling across a table in Woodbine last Sunday and shows that this insect is still present in our area - so keep an eye out and, well, you know, quietly remove them from the gene pool. The key character to look for is the row of red spots along the back, turning to blue toward the front end [photo by Mike Crewe]. Have you got the bug bug yet? If not, why not come and join one of our Sunday morning Belleplain Wildlife walks during the summer months when the birding is a little quieter... if nothing else, it gets you out into the great outdoors and away from the crowds just for a couple of hours. Check our online Calendar of Events for details. Belleplain always has some nice floral offerings too - this pair of Moccasin-flowers (or Pink Lady's-slipper) were a highlight of last Sunday's Belleplain Wildlife walk [photo by Mike Crewe]. Shorebirds continue to delight at Heislerville right now with Curlew Sandpiper and Glaucous Gull being recent highlights. Down at the point, the Black-necked Stilt was present at The Meadows early on 27th but has not been reported since, but Mississippi Kites continued to delight the crowds over the holiday weekend and the second Scissor-tailed Flycatcher of the year was at Higbee Beach on the evening of 25th, remaining into the next day. 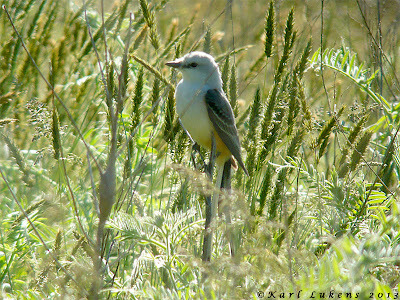 Scissor-tailed Flycatcher at Higbee Beach WMA on May 26th [photos by Karl Lukens]. Mississippi Kites have been headlining the birding world at Cape May this weekend, as an almost unprecedented movement of birds took place through the area. The fun really started on Saturday morning when Vince Elia texted that a flock - yes a flock! - of seven Mississippi Kites was heading south from the Rea Farm toward Cape May Point. Participants of our regular Saturday morning walk at the site were right on hand to witness this wonderful movement of these graceful birds, before the birds reappeared right outside the CMBO Northwood Center. The party of seven birds all headed quickly back north and I managed to get a good look at them as they passed the Northwood Center. Following them back toward the Rea Farm, they soon turned on the speed and I just managed to catch up with a group of five birds as they passed right over my house and headed north over the canal. Five were seen a little while later back in the Bayshore Road, but after lunch numbers began to pick up more and at one time I heard rumors of perhaps 13 different birds in the area. Mississippi Kite over the Beanery on Saturday - typical of the great views we had of these birds as they played the gusty winds that we experienced that day [photo by Clay Sutton]. 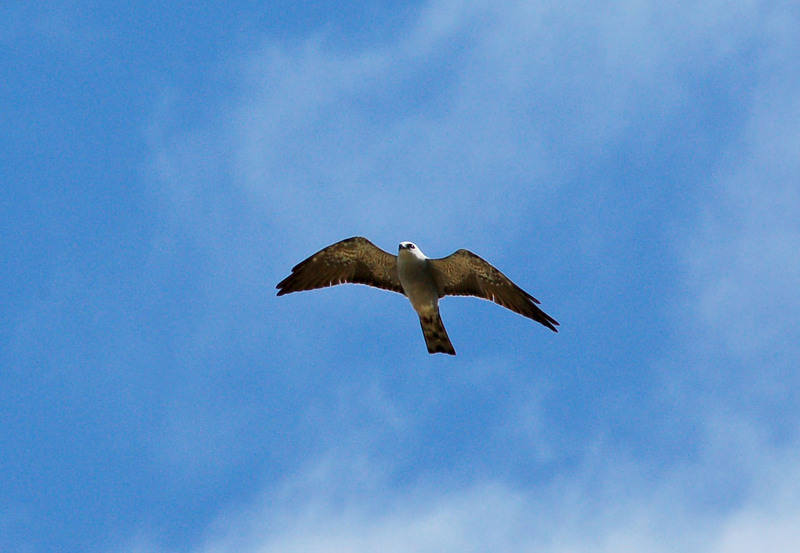 Another Mississippi Kite cruises over in pursuit of dragonflies for lunch [photo by Mike Crewe]. Raptors can look pretty big when they are aloft with little to measure them against; however, Mississippi Kites are surprisingly small, and this became really aparent to me when one of my local Common Grackles escorted this bird off his patch [photo by Mike Crewe]. Late May is shaping up to produce some interesting bird sightings, besides the Mississippi Kites (which are likely to show again tomorrow (fingers crossed!). 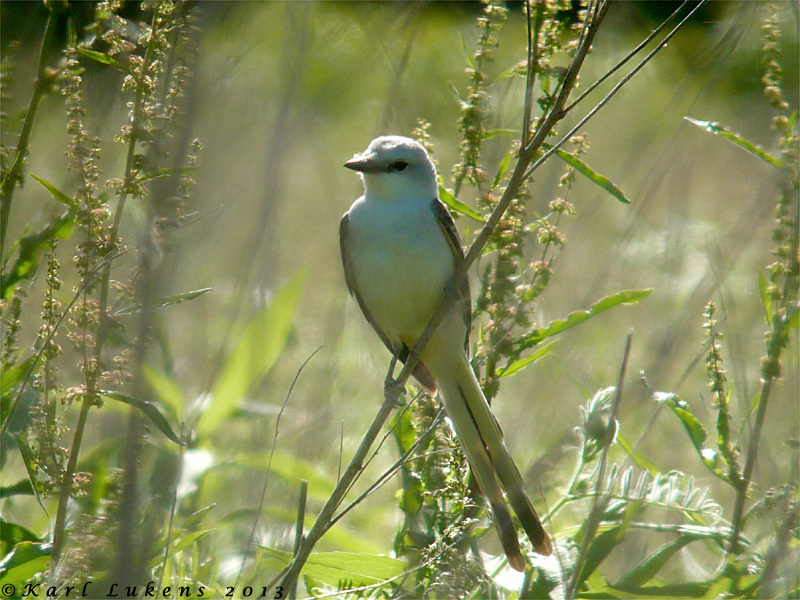 A Scissor-tailed Flycatcher was found in the third field at Higbee Beach WMA late on Saturday and remained into Sunday and a Glaucous Gull was at Heislerville today. Heislerville still holds excellent numbers of shorebirds and it is certainly worth a visit to check for Curlew Sandpiper, one of which has been present for the past few days. 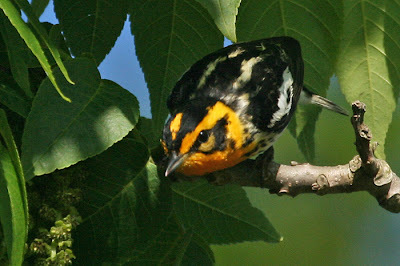 Yellow-breasted Chats seemed to be late arriving this spring but are now on territory at regular locations around Cape May Point, while Summer Tanagers seem to be present in good numbers around Belleplain State Forest. Belated news came in this evening of a Gray Kingbird, photographed at Brigantine on May 25th. There have been no reports of the bird so far since that date, but it may well be worth keeping an eye out for if you are headed that way. Kentucky Warbler is never an easy bird to get on your Cape May list, but small numbers do still turn up in wet woods here with this one currently holding territory in Belleplain State Forest. Keep an ear out for their rather slow, simple but clear song [photo by Mike Crewe]. There has been a spate of Black-necked Stilt sightings this spring, from Heislerville, Brigantine, Corson's Inlet and the South Cape May Meadows - where this bird was photographed today [photo by Mike Crewe]. Cape Maygration part 2 - the birds came to the party! The dates for our annual Cape Maygration spring weekend event obviously have to be planned well in advance, so that venues can be booked, diary dates can be set and everything can be put in place to ensure that our eager visitors are all assured of a good time. But the weather? And the birds? Well, that's out of our hands and, believe me, this year was somewhat fraught to say the least! Weather trends this spring have not been bringing high numbers of migrants to anywhere on the east coast and we've seen 35-40 degree swings in temperatures in 24 hour periods on a regular basis. In the event, things worked out pretty well. Though we had some soggy spells at times (thankfully nothing like the downpours we had on World Series this year!) we mostly enjoyed pretty good weather. But what of the birds? Blocking wet weather systems continued to track east across the Mid Atlantic states to the south of us, pretty much cutting off any chance of a big fall out, but birds did get through and I know for sure that there was a whole bunch of smiling faces heading out of Cape May after the weekend - actually, many of those same faces are still here and still enjoying the magic of May in Cape May (did they really name the month after the place?!!). Winds that were unfavorable for northbound songbird migrants brought us some pleasant surprises, including some days when raptor movements on NW winds made us wonder whether we had skipped summer and gone straight into fall! As well as a sprinkling of Broad-winged, Red-shouldered and young Red-tailed Hawks, at least three Swallow-tailed Kites have passed this way of late, including this one, circling high with Turkey Vultures over The Beanery [photo by Mike Crewe]. ...and the poor old Ospreys continued to run the gauntlet of our local Bald Eagles [photos by Mike Crewe]. 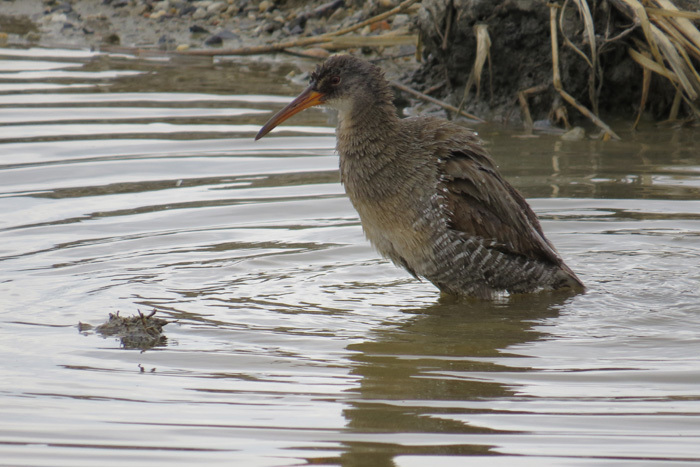 ...and Clapper Rails - with a little patience - do eventually come out for a wash and preen after caking themselves in black mud while pursuing fiddler crabs [photos by Mike Crewe]. ...with much activity from Black-crowned Night Herons as they collected twigs for their nests. And of course Heislerville has built up a great reputation for attracting masses of shorebirds in spring, giving plenty of opportunity to scan through for itinerant phalaropes, Black-necked Stilts, Curlew Sandpipers and other goodies. 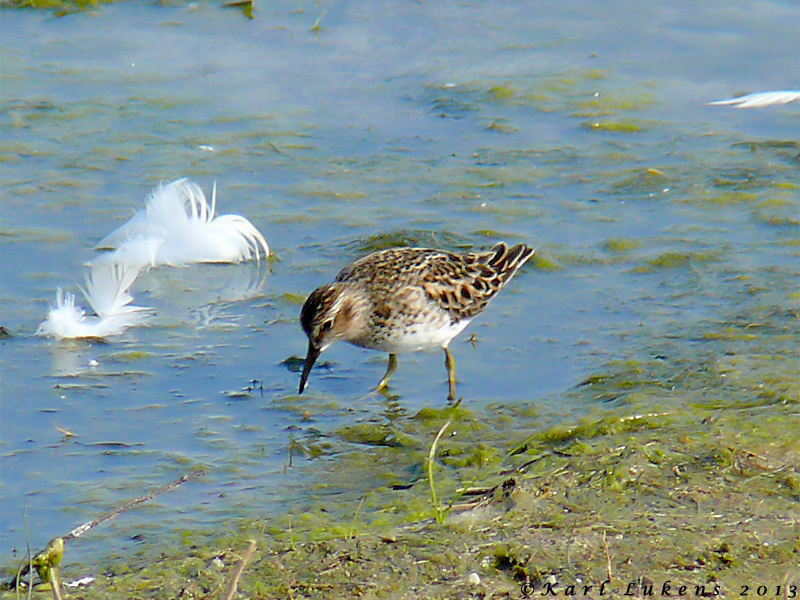 But it is as a resting location for thousands of Semipalmated Sandpipers that Heislerville really excels, and allows researchers from NJ Audubon and other organizations to study the worrying downward population trend of this species [photos by Mike Crewe]. See you in the field!!! Our spring weekend, affectionately known as Cape Maygration, has come and gone. It may only be one weekend of the year, but it is amazing how much planning goes into making sure that everyone has a good time - and how long it takes to get back to normal again afterward! If you were here for the weekend, we were pleased to see you and so grateful for your support of our work - and you will know what a great time we had. If you couldn't make it this year, well I'll give you a sample of what we saw and maybe you will be able to join us another time. 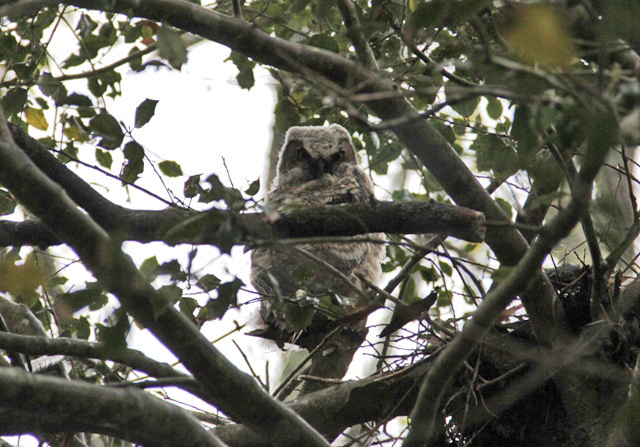 In this first review, I'm posting a simple photo gallery of some of the great birds seen during the event - a long weekend in which nearly 190 species of birds were recorded during our Cape Maygration events (and there were a number of other bird species that we know were in the area too!). It really is great to see so many people getting into wildlife photography these days, something that the relative cheapness of digital compared with film has no doubt played a part. This boom in wildlife photography is certainly something that we have responded to and if you check out our online events calendar or the Kestrel Express, you will see that we have photographic walks, workshops and tutorials more or less throughout the year, under the expert guidance of both Scott Whittle and Mike Hannisian. So here's some highlights from the past week, all taken by friends and weekend participants in and around wonderful Cape May - or should that be Cape A-Mayzing!! 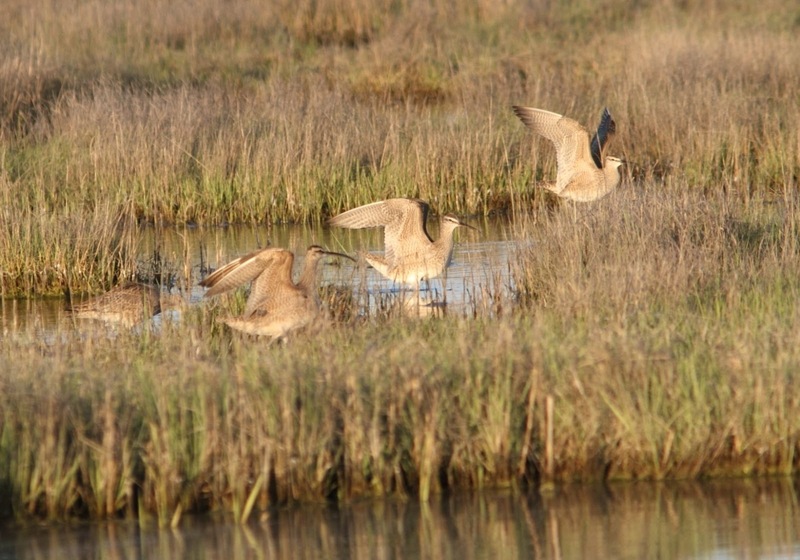 One of spring's great highlights in the Cape May backbays is the gatherings of shorebirds that take place in mid-May. Our regular boat trips out into the marshes around Jarvis Sound regularly offer fabulous opportunities to photograph flocks of Whimbrel, pausing to feed up before continuing north to breed [photo by Beth Polvino]. Just when you have decided that you are destined never to see a Clapper Rail, one pops up right in front of you! This bird was washing yukky saltmarsh mud from its plumage and made a great subject for photography at Heislerville [photo by Peter Langman]. The great diversity of shape and size in birds is always something to marvel at. 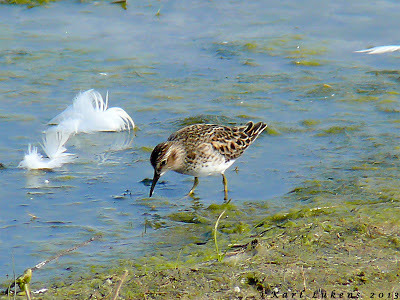 This Least Sandpiper at Cape May Point State Park is not much bigger than a single swan feather, drifting along on the water beside it [photo by Karl Lukens]. This slightly unusual male Orchard Oriole has been holding territory at the South Cape May Meadows recently. 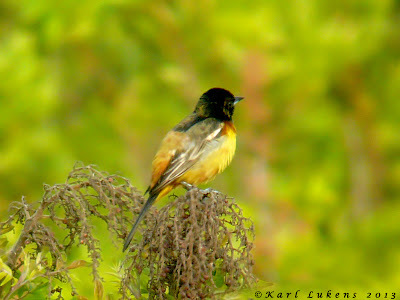 This appears to be a first-year male, but it is unusual - though not unheard of - for such males to have such an extensively black hood [photo by Karl Lukens]. Just when you thought it was too late to see one... 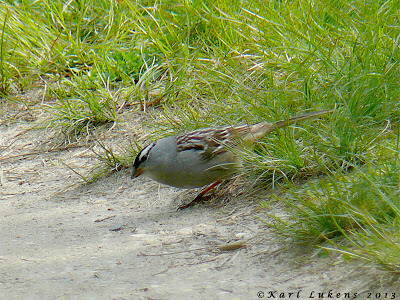 I haven't seen a White-crowned Sparrow around Cape May for a long time now, but May can throw up odd birds such as this individual which showed up in the state park for just one day last week [photo by Karl Lukens]. 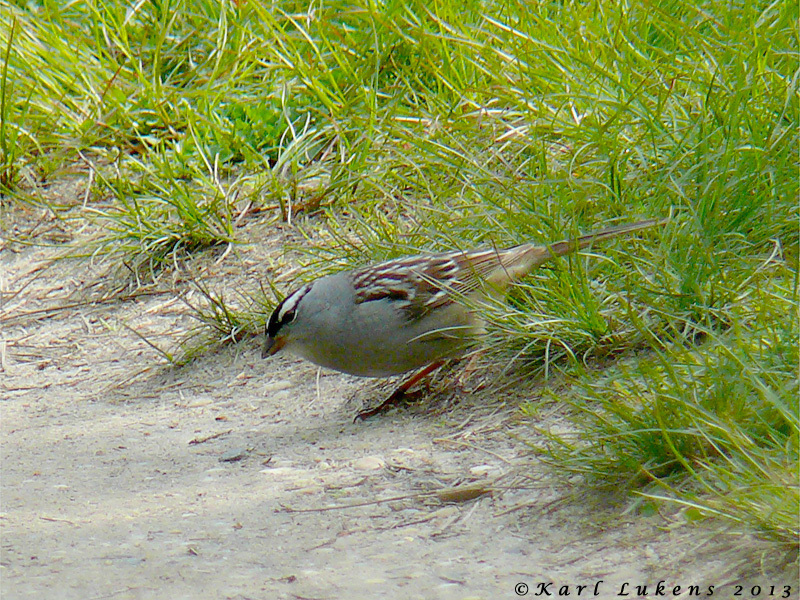 Not to be sniffed at, even the common birds can provide temporary eye-candy to Spring Weekend participants. 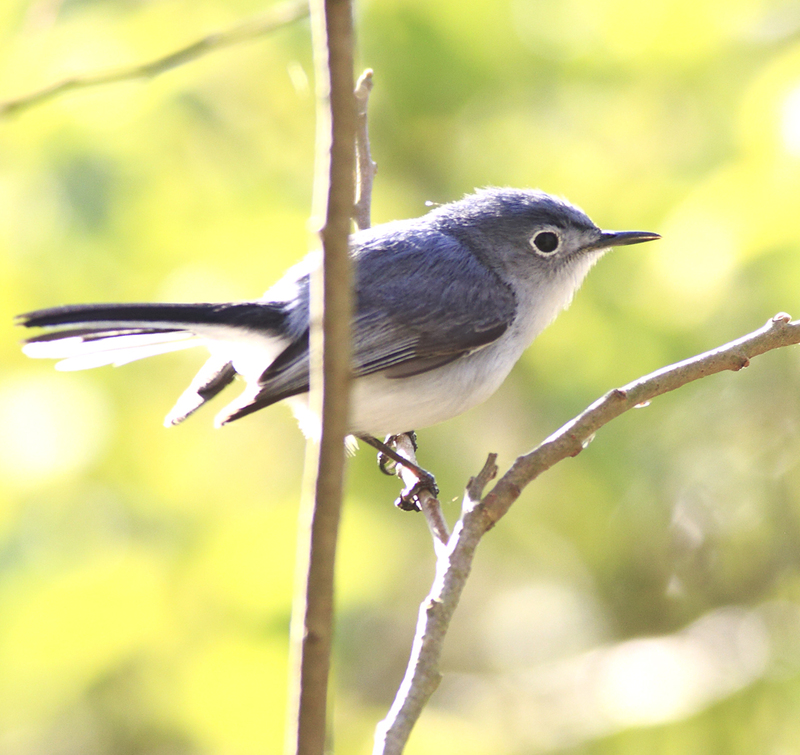 Blue-gray Gnatcatchers are always a delight to see, as well as to study more closely [photo by E J Nistico]. 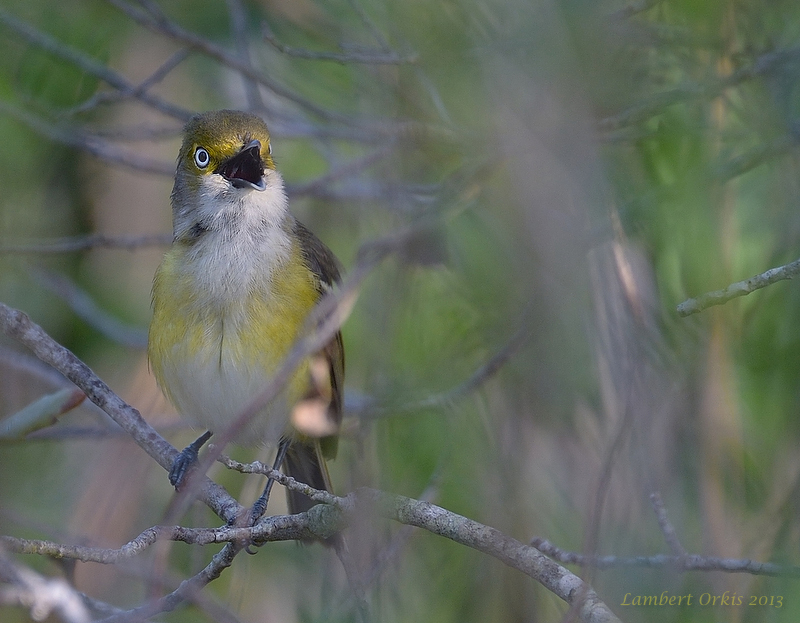 White-eyed Vireos pulled out all the stops this past week and set aside their usual skulking behavior to disport themselves before an appreciative audience [photo by Lambert Orkis]. 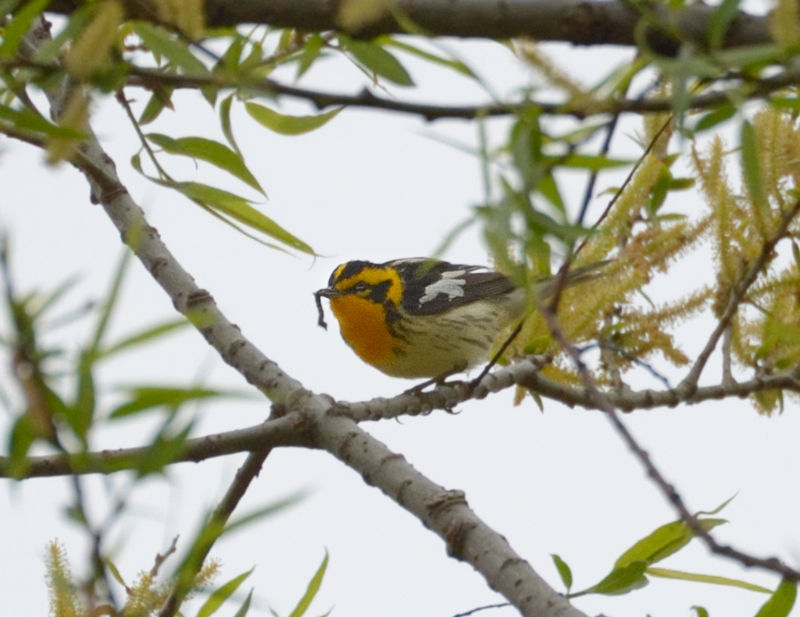 Despite a dearth of good westerly or south-westerly winds so far this spring, a good handful of warblers made it through in time for spring weekend. Blackburnian Warblers were present in good numbers some days and included this very obliging bird in the pond-side willows at The Beanery [photo by Lambert Orkis]. Some real stars flaunted themselves before the cameras and really made the weekend for many folks. 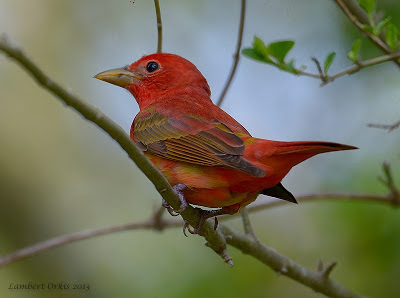 This first-summer male Summer Tanager posed beautifully at the Higbee Beach parking lot for all to enjoy [photo by Lambert Orkis]. 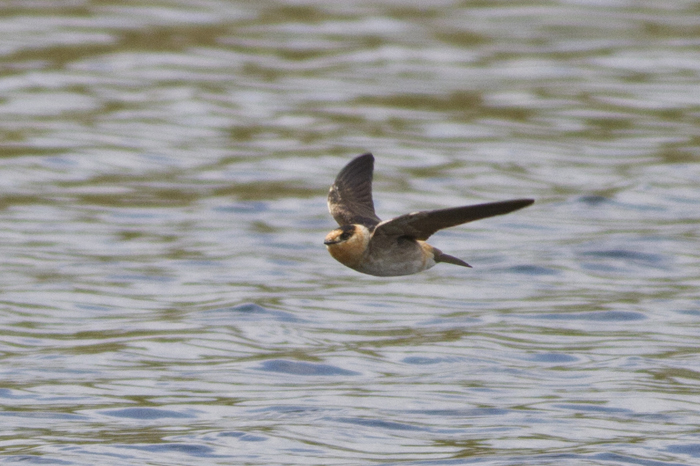 Not photographed on our spring weekend - but worthy of note certainly - were the Cliff (below) and Cave (above) Swallows that hung out at Bunker Pond recently. 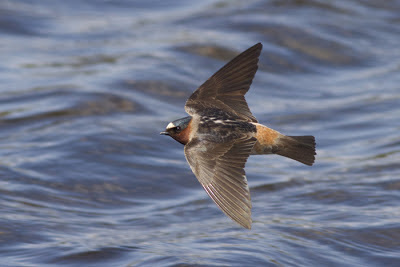 Cave Swallows seem to be increasing on the east coast of the US so it is worth having an eye in for their appearance. Compared with the Cliff Swallow below, note Cave's orangey (not white) forehead and much paler throat [photos by Sam Galick]. While we are on swallows, take a trip to CMBO's Goshen Center to get excellent close views of the Barn Swallows nesting above the front door [photo by Beth Polvino]. Mid-May is certainly a great time to be at Cape May!!! World Series Here We Come!!! 5 4 3 2 1....WSB! !